Currently, all SPYERA software products are available at a special offer. To buy the most popular software for a discounted price, please choose a suitable package plan and enter the SPYERA coupon code as you check out of this website to avail this wonderful opportunity. 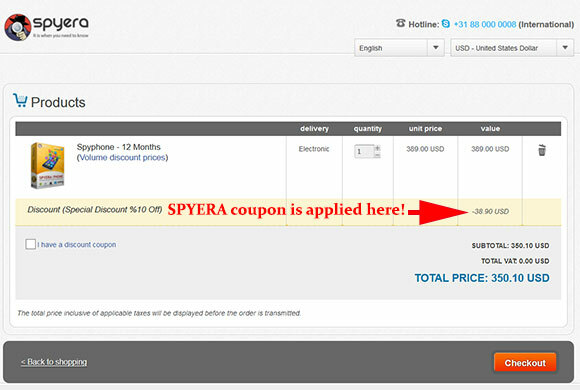 How to Redeem SPYERA Coupon Code? Buying anything at a discounted price always helps in saving money. Now, you can save up to 80% OFF on buying any SPYERA products, all you have to do is to select a valid package plan and click on our special SPYERA coupon code to get this discount automatically. SPYERA is an undetectable spy software that enables users to monitor anyone’s cell phone activities reliably. It comes with an extensive range of spying features that let users to record various cell phone activities for easy monitoring. It is compatible with all major smartphone operating systems and can be installed on multiple mobile devices under one license. The software is easy to use and ideal for parents and employers to keep an eye on children and employees respectively. With an advanced set of features, user-friendly control panel and good customer support; the software is perfect for spying on anyone discreetly. Click Here To Go To SPYREA.com Now! As SPYERA offers the most sophisticated spying features which provide superb surveillance of a person’s mobile phone activity, it is certainly the best software for spying on anyone. It is one of the few spy software that still offer hidden surveillance of a cell phone unlike most other renowned programs which now inform the mobile user about monitoring. The software works well on most cell phone operating systems, however, it does require a high-speed internet connection to send the monitored data to the online account of the user. The installation and setup is very easy for this software. You need to have the physical access to the phone to install the app. Once installed, rest of the job is of the SPYERA and you need to do nothing. After installation, the app starts to work in the stealth mode so the user of the targeted smart phone can never know that the app has been installed there. It doesn’t interfere the normal working of the cell and secretly uploads the data online. Do I Need Physical Access of the Phone to Install It? 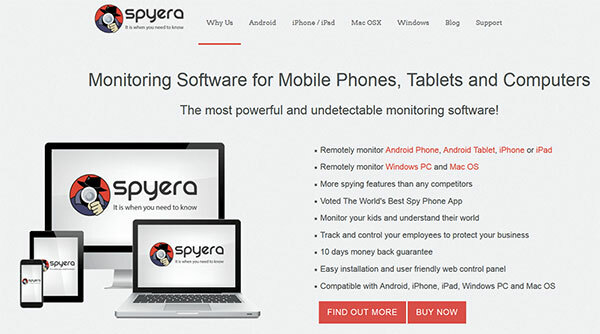 Yes, you need to have the mobile phone physically for about three minutes to install SPYERA. The installation process is really simple, all you need to do is to open the private download URL provided to you in the welcome email to download and then easily install the software by following the installation wizard instructions. In order for SPYERA to work, a person needs to choose a package plan from “http://spyera.com/purchase/” by selecting the duration of service and clicking on the “Buy Now” tab. After that, the prospective buyer needs to provide the billing information and agree to the terms and conditions to finalize the order. Once the order is confirmed, the buyer will receive a welcome email in which a download URL will be present for downloading SPYERA. The user needs to download the software by using the targeted smartphone and follow the installation wizard instructions to complete the installation process once the downloading procedure completes. After setup, the software will automatically start monitoring the device and send all the monitored data to the online account of the user. In order to check the logs, the user simply needs to login to his online account by following the account details provided in the welcome email. What’s the difference between SPYERA PC, Tablet and Smartphone versions and the All in One Version? 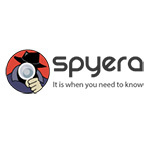 SPYERA PC allows users to monitor the activities done on a Windows desktop computer and lets them check the emails, web history, multimedia files and internet messenger chats discreetly. While, SPYERA tablet and smartphone monitors the Android and iOS mobile devices and enable users to check the communication logs, track current location and monitor the internet based activity done through such devices. Whereas, SPYERA All in One, as the name suggests, allows users to monitor multiple devices at once by using their own web account. It spies on the activities done on mobile devices, such as smartphones and tablets as well as a desktop computer; and delivers the monitored data to the online account of the user for inspection. Also, the All in One plan offers all the advanced features provided on the official website SPYERA.com for monitoring the mobile device activities of an individual reliably. In which Countries SPYERA available? SPYERA is a globally renowned software which is not limited to any particular country. It can provide its spying services to any individual living in any country where mobile phone internet services are available. How do I read the SMS and call logs? In order to view SMS or call logs, a user needs to login to his online account and view the monitored device logs and events. The user can also download a spreadsheet in which the details of all monitored events will be included. The official website https://spyera.com/ has everything in a single place. Just scroll down to see what you are looking for. When you want to buy it, just click on the ‘Buy Now’ button and the software of your choice will be presented to you after the confirmation of the payments. If for any reason you are unhappy with their spying software within 10 days of purchase, they will refund your money in full. Aside from the amazing features, SPYREA also has an excellent Support Department that can assist you with fully maximizing the usage of the software. Whether you are using SPYERA for an android or an Apple device, you can rely on the software to provide you all the cellular monitoring services you need. The requirements, although they may vary for Apple and android users, are all easy to meet. Physical access to the device for around 3 minutes. The device must be jail-broken. WhatsApp, Skype, Line, BBM, Facebook, Viber, Instagram and Email features will require the target device to be rooted. All in all, SPYERA is an outstanding cell phone monitoring software that allows parents and employers to secretly track & monitor on the activities of children and employees respectively. It is one of the few software programs that offers discreet surveillance of the cell phone activities of any individual. With an advanced set of features, good customer support and user-friendly control panel; SPYERA is certainly worth buying for monitoring anyone’s cell phone activities secretly. In order to buy Spyera app, a prospective buyer needs to visit the official website (www.spyera.com) and choose a suitable package plan. After selection of a pricing plan and the duration of service, the buyer needs to finalize the order by providing the billing information and agreeing to the terms and conditions. Once the order is confirmed, the buyer can download the undetectable monitoring software to the targeted device easily and install it on the device by following the instruction of the installation wizard. Once the software is setup, the user can login to his secure online account and control as well as monitor the targeted device by clicking on the tabs provided in the command center. However, if you buy this hidden spy phone software now, you can get a special discount. In order to take advantage of this amazing offer, choose a suitable package plan and enter the SPYERA coupon code to purchase this software at a promotional price.